It’s no secret that updating your passport is about as fun as going to the DPS in the middle of summer at noon. It’s a huge hassle, even if not particularly difficult, and the process could take up to six weeks. Which makes a passport or visa application rejection based on a poor passport photo all the more frustrating. The secret to a guaranteed accepted photo? It’s simple. A good photo. One that follows all the passport and visa photo requirements. Did you know that passport photo specs are surprisingly picky? China’s passport and visa photo requirements are tricky – get them right the first time! China for example, requires an uncommon passport photo size: 33mm wide by 48mm high. The Vancouver Chinese Visa Application Service Center had to write a special post reminding the public to submit passport photos that fit the requirements or face rejection (pun intentional). You could miss your flight and have waited at Walgreens for nothing. Why not spare yourself the agony and get it right the first time? If you are traveling to China for work or possibly as a tourist, make sure your China passport or visa application photo adheres to their requirements. At Innovative Images, we do the research, sizing, and cutting for you. We guarantee it will be accepted. We’ll make sure you have one less thing to worry about amidst your travel plans. 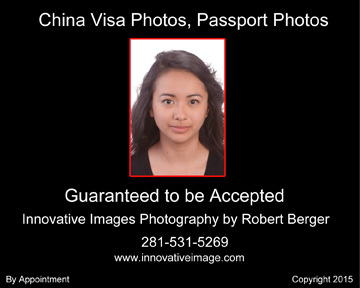 So go ahead, schedule your passport photo session with us (281-531-5269). Take a great looking passport photo. Then sit back and enjoy your flight.